Cheese and mountains. 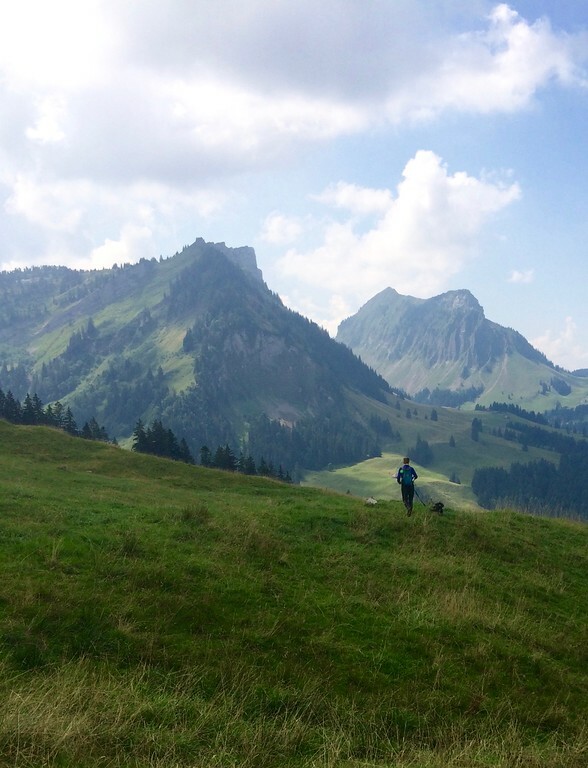 If I had just two words to describe our time in Switzerland, I’d pick those two. When I was volunteering at Soi Dog, a dog rescue organization in Thailand, I made a friend from Switzerland. She invited me to stay with her family if I ever visited the area. Last year I took her up on this offer. Her family lives in the Canton of Bern, an area near the Swiss Alps. Staying with my friend and her parents meant that they wanted to show me the local sights, hikes, and foods, meaning mostly cheese. Oh, there were so many kinds of cheese! The Swiss are very confused about what we call ‘Swiss cheese,’ as they don’t really have a cheese that resembles our Swiss cheese. My friend’s family makes Alp cheese (alpkäse), which comes from cows that spend their summer months in the alps. 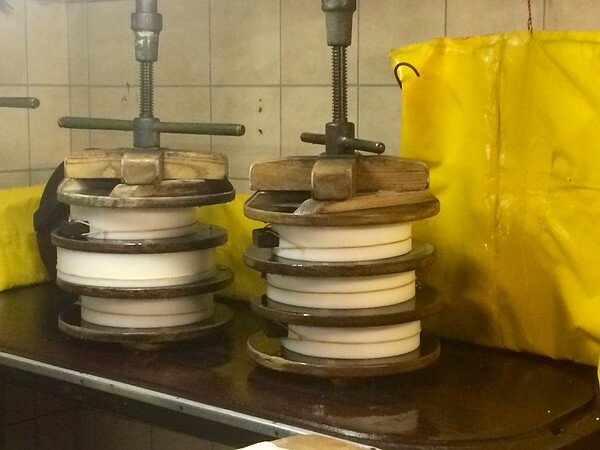 Alp cheese is made in a very traditional way with traditional materials. This means copper cauldrons over a wood-burning fire, raw milk, precise timing, cheesecloth, spring form-like pans, a hut for aging, and a great cheese maker. The family cheese-making operation was in the Bernese Oberland, a mountainous region over an hour’s drive away from their house. The farm was nestled in an amazing grassy valley framed by looming mountains. I’m a big believer in working for my food, and this was no exception – you couldn’t actually drive the whole way there; you had to hike the last part. This was more than okay with my dog, Alfie. He loves hiking, and was eager to see a new place. 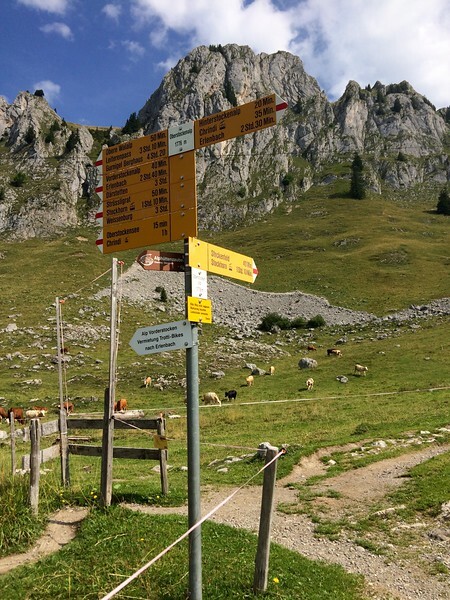 Luckily for newcomers, hikes in Switzerland are very well-marked and easy to find. 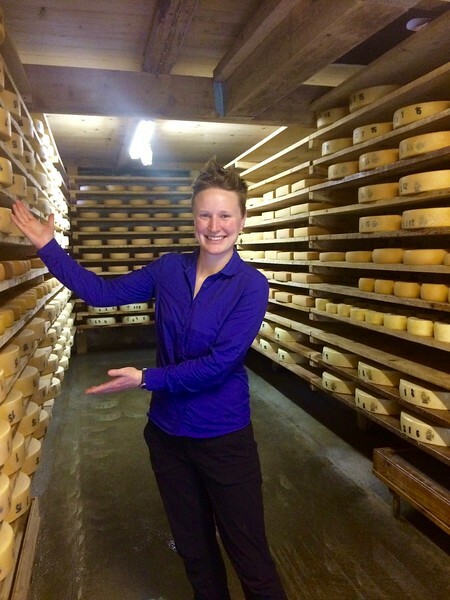 The first stop along the alp cheese tour was a hut that I deemed “the cheese aging library.” Think of an old mountain cabin with no windows dimly lit and lined with shelves. Instead of books, you have giant cheese wheels that they call loaves. In the cheese library, the cheese is treated to daily brines and salt rubs. We reached the main hut, which was where the magic happens. Inside was the largest copper cauldron I have ever seen. If they ever tired of cheesemaking, this could be converted into a small hot tub. The cauldron (called a Chessi) hangs on a wooden arm that swings it over a wood-burning fire where the raw milk and rennet are stirred continuously. 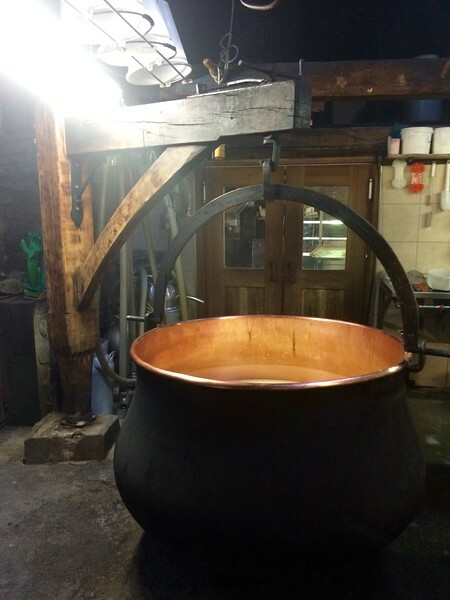 When this is done, the cauldron is swung out so it hovers over the floor and the curds are collected with a giant cheesecloth and forced into the spring form molds. Each mold is covered by a wooden separator, topped with another mold, then screwed into place so the extra whey is forced out over time. Later they are flipped and then insulated with bubble wrap. After the cheese-making tour, my friend’s mom and I went out for a hike. It had been an usually hot summer and so the dogs and I were eager to get out of the sun and into the shade. We passed by several cows who paid us no mind. I’m pretty sure they were too busy enjoying the beautiful place they lived in to notice two women and two small dogs. Partially convinced that I was either in Lord of the Rings or Beauty and the Beast, we stopped to enjoy the view and have some lunch. Here my friend’s mom offered me another cheese-inspired product: Rivella. Made from milk whey, it’s a soft drink whose original formula is akin to drinking liquid Smarties. Interesting. I still have mixed feelings on this one. Back at the cheese hut we were offered several different kinds of cookies including cheese cookies, whose simple recipe of butter, flour, and cheese with a dusting of herbs was mouth-wateringly good. Having bought some alp cheese and butter, we took it back to the house and had some that evening. For some reason, its mountainous origin led me to think that alp cheese would be very strong and smelly like gruyère, but this hard cheese is more mild and creamy – kind of like a slightly softer parmesan without that bang of flavor. The taste of the cheese varies with the place it was made and with the cheese maker, as the cheese is almost exclusively made by hand. But oh my it’s good with bread. Especially with the Swiss zopf (knot) bread. The good news is that you don’t need to know someone who has a family member that runs an alp cheese production to get some. There are many places you can go to watch it being made. It also pops up in places where you least expect it. 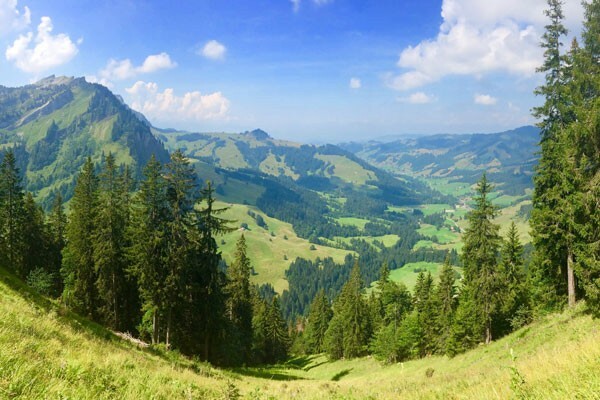 If I haven’t already convinced you that Switzerland is full of good hiking and cheese, what if I told you that they also go together? 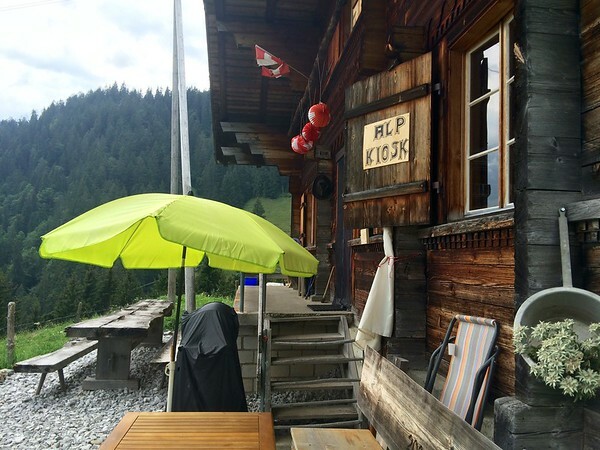 Since alp cheese must be made in the alps and hikers regularly walk through the pastures where it is produced, the farmers who are busy tending to their cattle have set up things called ‘Alp Kiosks’. They are essentially a refrigerator containing alp cheese, milk, soft drinks, teas made from the alp herbs and flowers, and occasionally knit products. You simply deposit your money in a box and take your cheese. Cheese adventures in Switzerland are not limited to alp cheese either. 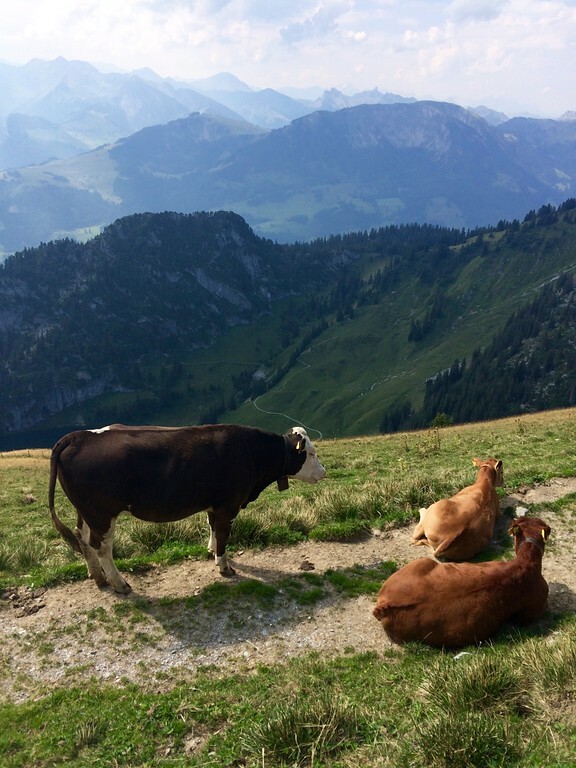 You can visit the town of Gruyères, try some raclette, and dip into some fondue. Oh, and most of them can be obtained in epic mountain places or in the vicinity of castles. Now go have a hiking and cheese-filled adventure of your own! 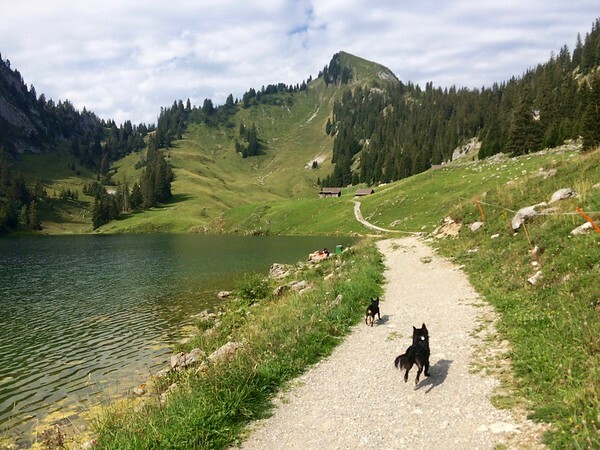 Elena Sipe runs the dog travel website Travel Hund, which exists to help people travel with their small dogs both internationally and domestically. 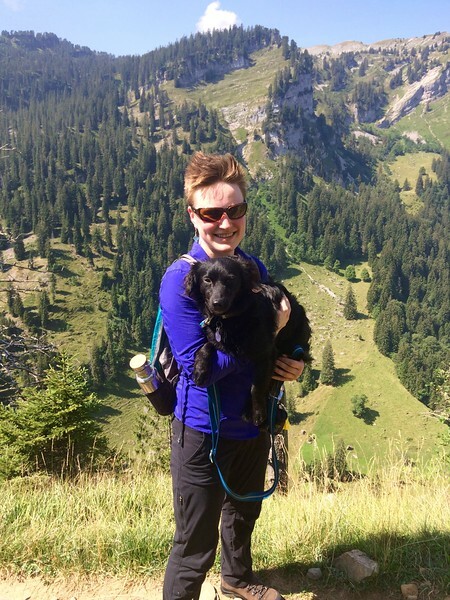 Having grown up with large dogs, Elena was very pleasantly surprised to find that her small rescue dog, Alfie, was just as capable of hiking and exploring as any big dog, and was much more portable to boot. 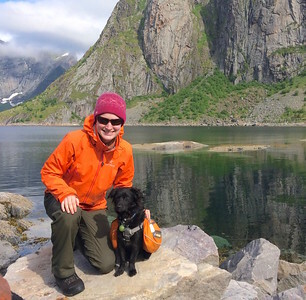 Through Travel Hund, she seeks to debunk the myths around traveling with dogs, gives advice, and shows that small dogs are tougher than you might think. Find Travel Hund on Instagram and Twitter. Really great post Elena! That cauldron is huge! !